While contemplating the gifts he would like to receive for Christmas this year, 9-year-old Mikah Frye was struck with a realization: the $300 that would be spent on purchasing an Xbox for him could be used in a much better way, such as buying blankets for the homeless. Because Mikah’s family fell on hard times three years ago and, as a result, lived in a homeless shelter for weeks, he knows what poverty is like. Every day, the young boy would receive a blanket. And every day, that blanket was given back to the shelter. Furthermore, winter conditions in Ohio are uncomfortably frigid. These factors made the decision a no-brainer. Mikah traded in his wish list for approximately 30 blankets ($10 a piece) then, with some help, handed them out to people living on the streets. He also included a note in each blanket. News of the young boy’s good deed quickly spread. Even the manufacturer of Xbox, Microsoft, found out. Executives were so thrilled by Mikah’s generosity, that they decided to reward him. 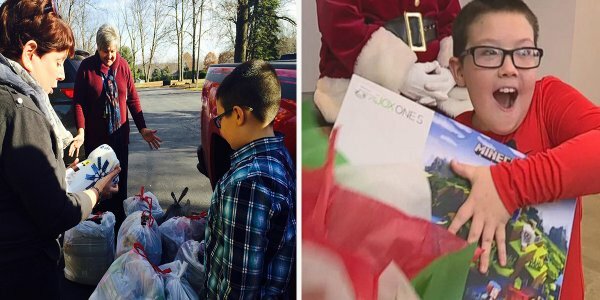 On a very special day, Mikah was led to the back of a store where Santa had bags full of gifts — including the prized Xbox. Mikah, of course, was elated to receive the gift and likely felt proud of himself for putting others first. “It’s just amazing — it’s a blessing. Mikah is a blessing to our family, and we thank you very much,” Terry said.
? Study: Young People are More Generous Toward Charities than Any Other Group These Are The Top 25 Most Hacked Passwords of 2017 ?